These initiatives include conducting a food donation drive at all Union Savings Bank branches, where they will accept non-perishable food donations now through February 16. The bank will also waive monthly fees related to deposit accounts and offer interest-free loans to federal workers who live or work in the Union Savings Bank community and are not being paid during the government shutdown. There are more than 8,000 federal employees in the state of Connecticut, and an estimated 1,500 have been affected by the government shutdown. As Connecticut’s local bank, Union Savings Bank is committing to helping these employees and their families in the community by collaborating with the City of Danbury to provide relief and support. The bank invites those affected to contact a branch manager for assistance. 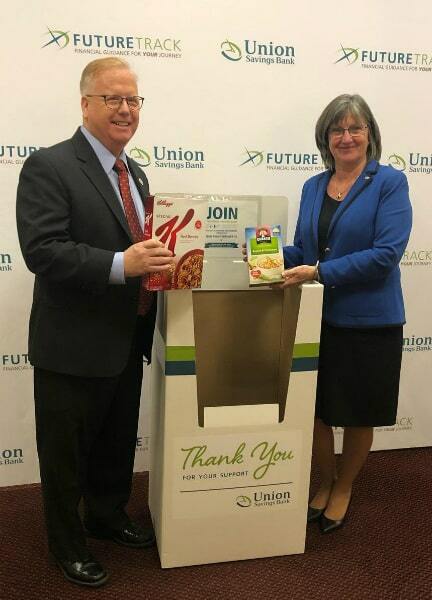 Mayor Mark Boughton and Cynthia C. Merkle, President and CEO of Union Savings Bank, stand next to the USB collection box for non-perishable food donations. There will be collection boxes located at every Union Savings Bank branch.